The sun shown brightly from the skies on Haddonfield today, bringing its residents out to play, shop, eat and garden. I arrived in town ahead of schedule and contacted Carlton and Rose Chin, the organizers of the Play it for Mia benefit, to let them know that I was going to spend the day exploring this beautiful town. Bogart was in dog heaven with all of the squirrels and dropped ice cream. 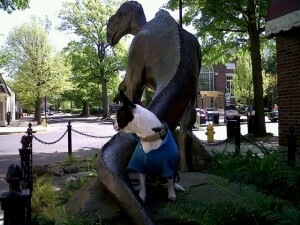 Bogart was in a perfect paradise, until that is, he met Haddy, a sculpture of the first dinosaur unearthed in the world, right here in New Jersey. I assured Bogart that Haddy is in fact a harmless herbivore, he then gained back his alpha-dog mentality and got into a stare down with Haddy. Haddonfield isn’t just a town, it is a community; a community of very friendly people; Its residents were very interested in learning all about The Kindness Bus Tour. I must have had thirty long conversations with people from the area. I got a sense after awhile, that this community is involved in many ways of reaching out to those in need. Visiting Haddonfield, needs to be on everyone’s bucket list. I met so many wonderful people today, all were so helpful and gracious with their offers of invites to their homes for home-cooked meals. I met two wonderful sisters, from a nearby community, who just had to stop by the bus to get some pictures of Bogart and The Kindness Bus. They were so thrilled, I asked them to write on the bus. Amanda, a soon to be school teacher, wrote, “If you see someone without a smile today, give them yours” what a great attitude for a teacher to have. Melissa wrote of finding a cure for childhood cancer, she is a talented soul who works tirelessly for alexslemonade.org an unbelievable nonprofit which raises funds for research, travel and nursing for those in need with help because of childhood cancer. Meeting Melissa on the day of the Play it for Mia benefit has meaning which will become apparent over time. Please visit their website, to offer much needed help. Today I had the undeniable pleasure of meeting Mayor Tish Columbi, she had a big hand in making the Play it for Mia benefit a reality. She also arranged in helping to make my stay as comfortable as possible. What a charismatic, involved individual she is, whom Haddonfield is fortunate to have as a leader. Her interest in One Million Acts Of Kindness made it seem as if she gave me a key to the city. This evening’s benefit was flawless, which was a testament to the long hours of planning and practicing. Ms. Yonitte Ryger, an accomplished violinist, had the audience’s attention the instant bow met strings. Julia Chin, daughter of Carlton and Rose played her wonderful piece with great pride as her parents seemed to hold their collective breath until finished. Bravo Juila! Pianist, Isaac Park was a talent to say the least, his solo was what Chopin had in mind when he penned it. Yonitte’s father, Raphael, Concertmaster, Orchestra New England, spoke of the background before each piece and played Bach’s Concerto for Two Violins with his daughter with brilliant precision. With all the talent tonight, the house was “brought down” by Mia’s aunt Nancy Mulvenna as she spoke of the accomplishments and bravery of Mia and her family. To all involved, it was an honor to speak to those attending, of One Million Acts Of Kindness, it was a night I will carry in my heart forever. This entry was posted on Saturday, April 24th, 2010 at 12:50 pm	and is filed under Kindness. You can follow any responses to this entry through the RSS 2.0 feed. You can leave a response, or trackback from your own site.